"As you begin with us a study of the earth adventure in which you are presently participating, you are setting out to discover yourself. You will discover yourself as you existed in the beginning creation of all souls, of all life, and of all universes; as you exist now as a physical human being walking upon a physical earth; and, as you shall exist in the future as an illumined being, having created, through many lifetimes, a portion of reality that is your unique expression of the force of God." "The Guides" through Ron Scolastico, Ph.D. In The Earth Adventure, loving spiritual guides take you on an extraordinary journey with your soul through the underlying reality of the universe--from it's creation to the present and into the future. You will follow your journey as a soul choosing your parents, creating your human personality, incarnating into your present life, the stages of your earth life, the process of death, the after-death life, and reincarnation. You will learn about your personal Guides and how to merge the human and the divine to create the joy you seek in life. 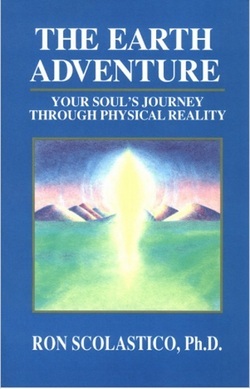 First published in 1988, "The Earth Adventure" was Ron Scolastico's first book. Originally published in hardback by Universal Guidance Press, the paperback was published by Hay House, Inc in 1990. Ron and Susan held many Readings to collect the wisdom of The Guides contained in this book. Ron then organized and edited the material to create a timeless and inspiring body of knowledge. "The Earth Adventure is a mystical and powerfully moving source of wisdom and inspiration." "This is the book I kept by my side as I helped my mother make her transition. I read it aloud and it helped both of us remember the larger spiritual truth during that bittersweet time." "Well worth your time, effort, and money if you are a person who wants to explore new thoughts and feelings, and are interested in spiritual reality." "This book is a spiritual sizzler." "The Earth Adventure is quite profound. The wisdom and guidance in this book is believable and sound. Highly recommended." "This book offers us a whole new beginning in the way we think about ourselves. The Guides retell the history of mankind, and instead of a history of war and strife, we find ourselves in a chronicle of love, creativity, and grandeur." Understanding the present and the future. Choices other than human life. "As a student of metaphysics for many years, I can say that The Earth Adventure is the most rational and loving spiritual framework that I have ever found. I heartily recommend this book to those who seek deeper insights into the adventure of life." "The Earth Adventure" discusses the nature, meaning, and purpose of human life from the largest possible perspective. It touches on everything from our ultimate cosmic destiny to the psychology of aging. Along the way it illuminates reincarnation, explains the place of feeling in cognition, and teaches how to understand and work with dreams. In short, it explains what living as a soul in physical reality is all about. Those who are already interested in higher wisdom will be immediately drawn to it. But those who are not as elevated in their interests, being fully absorbed in the everyday drama of ordinary life--those, too, will find much benefit in it as well. Though it talks about higher things in providing a sort of map of life for the rational soul, it does not ask one to "believe" anything or to accept anything on faith. Therefore both the fanatic believer and the firm atheist can read it with great benefit. I can't recommend this book highly enough.